Having someone over for dessert but you have no idea what to feed them because they’re Gluten Free, Dairy Free, or Vegan? Here’s a recipe for gluten and dairy free peach cobbler that will be sure to impress those with or without food allergies. And this recipe is just in time for the ripening of your Red Haven peaches from your tree. First, peel and slice your fresh peaches and place fruit in 2 1/2 quart dish and drip lemon juice over them. If you use canned peaches, drain and dump in dish. Cream together melted coconut oil and sugar, then add almond extract. Add in coconut milk, then rice/almond flour, tapioca flour, baking powder, xanthum gum and dash of salt. Mix well and spread over fruit. This will be thick and a tad lumpy. After this, I like to lightly sprinkle the top with a little sugar and a little freshly ground salt. Bake at 350 degrees F for about 25-30 minutes. I bake the cobbler until it starts to look caramelized on top, which gives a bit of a crunch to go with the chewy middle. Serve warm plain or with frozen ice cream of choice. I personally like it served up with a little bit of coconut milk if I don’t have any dairy free ice cream on hand. My husband tells me it’s delicious with vanilla ice cream. This recipe works great with using brown rice flour, or almond flour. After trying both, our favorite is the almond flour version. Careful, it’s addicting and you might want to eat this entire dish of gluten and dairy free peach cobbler. NOTE: Cobbler can be made with canned peaches, but it is always best made with fresh picked peaches from your peach trees from Western Gardens. Fall is a good time to plant trees. Welcome Gardeners! Looking for a good shade tree? With the heat of summer quickly approaching, check out our six favorite shade trees that will help you stay cooler as you enjoy being outside longer. These favorites are easy to care for and do well in our mountain desert climate once established. Our number one favorite shade tree Autumn Blaze Maple is a cross between a red and a silver maple. It is fast growing (up to 3ft per year), tolerates a variety of soils and is easy to care for. In the fall, the leaves turn bright red for which it gets the name “autumn blaze”. This maple variety can grow up to 50 feet tall and 40 feet wide and prefers full to part sun. This tree is a great option if you’d like a fast growing, easy to care for tree with show stopping colors in the fall. An easy pick for our top favorite shade trees list. The Japanese Zelcova is an underutilized species that has started to become more popular. It is considered a shade tree, but also showcases an ornamental quality with its vase like shape. Zelvocas look similar to an elm, but are disease and pest resistant. Once they are established, they are also drought tolerant. Mature height is around 60 feet tall with yearly growth between 1-2 feet. It does best in full to part sun. Zelcovas are ideal for planting by driveways or side walks because their roots will not disrupt the concrete like other trees root systems. The leaves also showcase deep red and orange hues in the fall. A beautiful choice and will be part of your favorite shade trees to have in your yard. Honeylocust, both thorn and thornless, is yet another tree that is fast growing and tolerant of many soil types. Mature height is between 30-70’ tall, and grows up to 2 feet per year. It provides lightly filtered shade. Honeylocust have small delicate leaves that turn a bright yellow in the fall and then blow away, leaving very little to rake up. They can also be used to stabilize hillsides and control erosion. 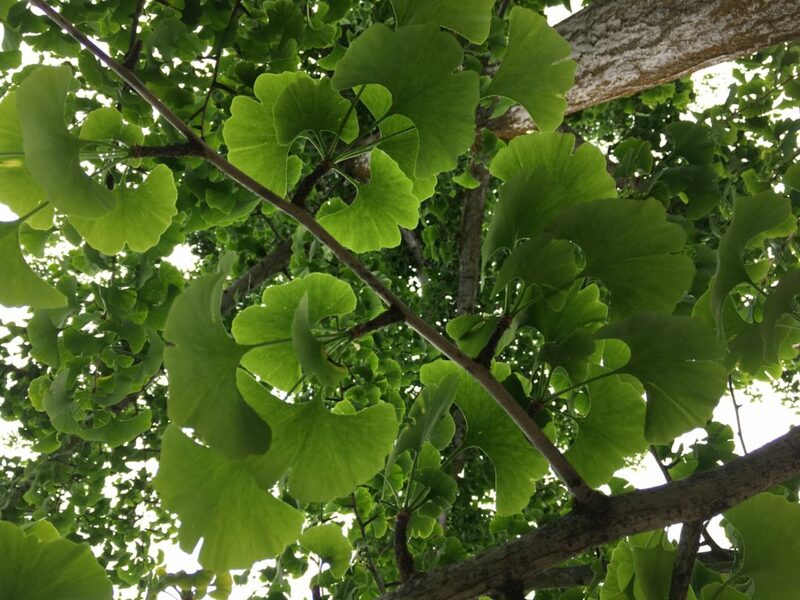 The Ginkgo is an underutilized species here in Utah, and has many unique characteristics to it. It is actually considered a living fossil, and some trees can live as long as 3,000 years! It grows 25-50 feet tall in maturity with a vase-like canopy reaching 25-30 feet wide. Yearly growth rate is 13’’-24’’ per year and tolerates a variety of soils. It is best if planted in full sun to part shade. This is another tree that grows well next to driveways and concrete. One of the unique features of this tree is its fan shaped leaf. Female trees do bear a fruit that can be messy, so ask your local gardening expert to pick out a male tree. The Eastern Redbud is the magenta flowering beauty blooming in spring. It’s the first tree we see in spring which makes people say, “Wow! Look at that tree’s color.” It’s unique green heart shaped leaf turns yellow in the fall. As a moderate grower, it will peak up to 20-25 feet tall and 20 feet wide. It is tolerant of most soils and likes even moisture throughout the season, being less drought tolerant than our other favorite shade trees. This native Eastern American tree offers four seasons of unique beauty, following up in winter with a beautiful branch structure and course bark. 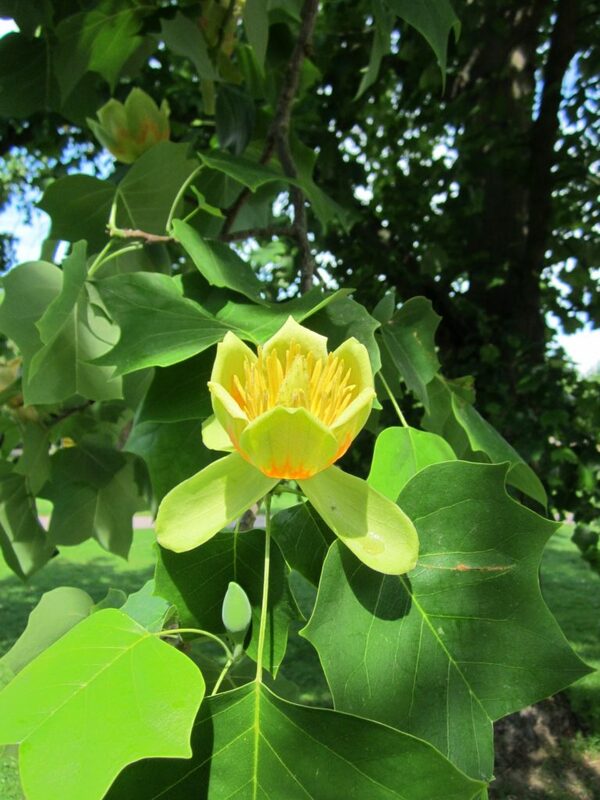 Another native North American tree, the Tulip Tree is a wonderful majestic beauty. Considered a perfect stand-out front yard tree, it also is often used for shade in the back yard. The wonderful shade tree is long lived, fast growing, tolerant of most soils, and very cold hardy. The yellow tulip like bloom opens in late spring and it’s leaves turn yellow in autumn. Be ready for its unique structure to reach 40-60 feet high and be 15-25 feet wide. Once established it is drought tolerant. Welcome Tree Lovers! 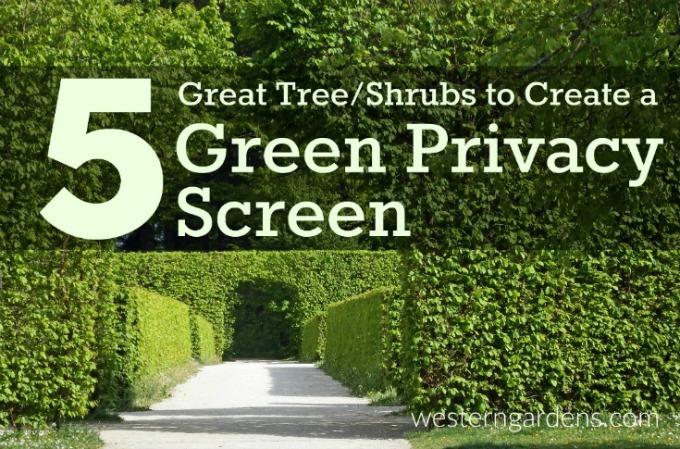 Want a green privacy screen in your yard? Sometimes a six foot fence doesn’t provide the kind of a soft green privacy screen you’d like in your yard. You may want to block out an unwanted view like a neighbor’s second story. Or you just want to create a feeling of your own private retreat in your backyard. My mother’s favorite bumper sticker is “Trees are the answer.” A green privacy barrier can make for a beautiful soft addition to your yard while doing the job you create it for. Trees to the rescue! First consider if you want a “green” fence year round (evergreens), or if you’re ok with a seasonal “fence” aka “deciduous” meaning that in the winter the trees lose their leaves and the barrier consists of trunks and branches. Below are some suggestions for creating a beautiful “green” fence to add interest, privacy and height to your yard. These are one of my favorite trees, with dark green needles and a columnar shape. Mature height at 10 years is 20 feet with widths of 5-6 feet. Can grow to 30 feet tall. These are fast growing, and require full sun. Plant 5-6 feet apart for more of a hedge look. If you’d like the branching to stay tight, look for a “wellspire” variety of the Columnar Norway Spruce. These are an evergreen shrub with a slow growth rate. Mature height is 10-12 feet tall and 3-4 feet wide. These also do well as foundation plantings and require partial to full sun. They have delicate dark green foliage. In the above photo, the hicks yew add height and privacy to a 6′ iron and stone fence. Beautiful! This is a fast growing shrub or tree, that does well in sun, part shade, or shade. It has green foliage year round, and berries that attract birds. Be warned, it has sharp thorns that are great at keeping unwanted people/animals out. Pyracantha is fast growing and if you begin trimming it, you will continue painfully doing so every 4 weeks forever. Letting to grow naturally (without trimming), will quickly give you a high green privacy screen. The variety Yukon Belle grows to 8-10 foot high privacy screen. It grows 6-8 feet wide so be wise where you plant. Some varieties grow to be 12 feet tall and wide. Ask your local expert at Western Gardens what variety is best for your yard. There are several. Another favorite tree for creating green privacy screens or hedges is the Hornbeam. It is a moderate growing, hardy tree with heights (depending on variety) of 30-45 feet in height and 10-35 feet in width. It does well in a variety of soils and isn’t too picky about sun exposure. You can plant this in a row and leave untrimmed or you can trim it into a neat hedge. The branching can get fairly dense, which provides a great privacy screen even in winter months. Once established, it is drought tolerant. The Frans Fontaine variety will stay more columnar in shape (30 feet tall and 10 feet wide) while the Fastigiata, also known as a European Pyramidal, has more of a triangular or pyramid shape. Some varieties get a beautiful golden fall color. Not to be confused with quaking aspen, Swedish Aspen are columnar fast growing trees. At maturity, these trees can reach 35-40 feet tall and 10 feet wide. They do well in full sun and have beautiful leaf colors in the fall. These are great for narrow spaces like lining a driveway, and they are quite hardy once established. 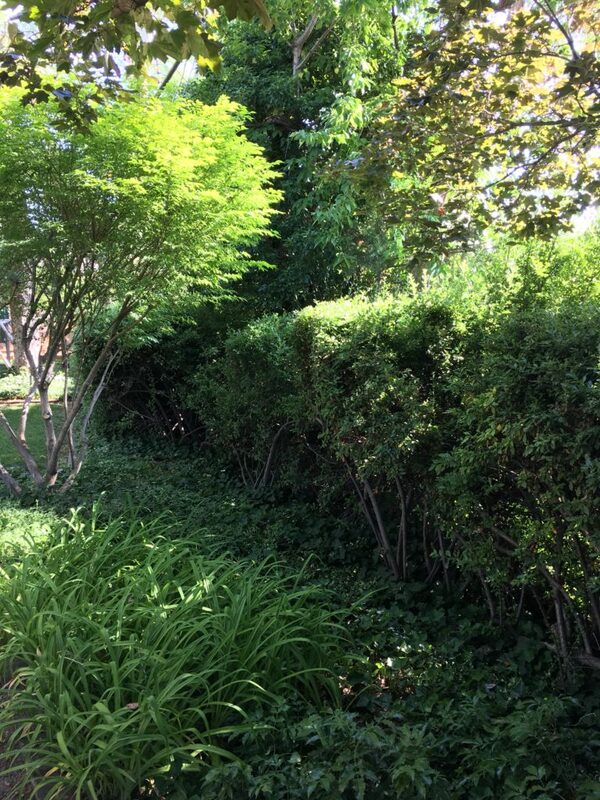 Spacing the trees of your green privacy barrier depends on the type of tree or shrub you select. You must keep in mind the width and height at maturity. For example, you don’t want to plant a tree one foot from an existing fence. Chances are that eventually, sooner or later, either your tree or your fence will have to move! Your gardening experts at Western Gardens can help you decide how close to a fence or property line to plant as well as the spacing between each tree for your green privacy screen. Planting New Trees 101- Secrets to Help Your New Tree Thrive! Welcome Friends! Glad you dropped in. In Utah, spring and fall are the best times for planting new trees. Here are a few secrets to help you find success with your new investment that will beautify and make your yard and home more enjoyable for a long time. The first step to a healthy tree is to purchase from a quality local independent garden center or nursery. Big box stores tend to get trees that look okay for a season but suffer down the line because of poor soil, crowding, root chopping, inadequate root ball size, rough handling, and poor care. Often these warehouse stores don’t own the plant inventory; it is on consignment, so less care is given to the material. A local independent store, like Western Gardens, also has experts who can help you pick the right tree for the conditions at your house and your growing Zone. Check for trees that have 10’’-12’’ of root ball per inch in diameter of the tree trunk. When selecting a tree, take into account the mature height and width. Material from a quality grower usually has a tag indicating the mature height of the tree. Some trees may look cute now planted a few feet from the house and close to another one, but after a few years this can become very problematic. Also consider planting a tree of an underutilized species in your area. Local independent gardening stores can deliver your tree for a nominal fee, and you can have the peace of mind knowing that it was transported carefully. If you are transporting your tree home yourself, make sure that it is properly secured and avoid going on the freeway or driving at high speeds. It’s preferable to transport them on their side in the back of a truck so that the leaves aren’t taking the brunt of the air flow as you drive. This can desiccate the leaves and put the tree into shock. As the tree is lifted in and out, be careful to handle gently. Dropping or rough handling can also put your tree into shock. This is often an overlooked step, or an after thought most of the time. Every tree has different branching and some have a better side than others when it comes to aesthetics. First place the tree in the spot where you’d like to plant it and turn it until the branching is how you like it . Take a few steps back, walk around, and look at it from different viewing angles. Consider the main viewing point for the tree, or other things like proximity to fences, driveways, side walks, and power lines. Dig the hole twice as wide and twice as deep at the root ball. If you are planting a tree that likes well drained soil, but you have clay soil, then be sure to dig the hole much wider and supplement with some good soil. Bumper Crop mixed in with your soil is one of our favorite recipes. The hole should not be deeper than the root ball itself. Use your hose to fill the hole with water and let soak down a bit. This insures that there will be good moisture deep down for the roots of your tree to take hold. If your tree came out of a bucket, check to make sure the roots are not root bound, or circling around itself. If they are, take a razor blade or knife and cut an X on the bottom and make 4 cuts along the sides. If it was wrapped in burlap and/or with twine, remove any plastic twine because this will not decompose. Loosen the burlap. These steps are important so that the roots do not become wrapped around itself causing the tree to girdle itself and die. Place the tree in the hole and backfill it around the sides. Around the trunk, mulch can be 1’’ thick and then increase in depth up to 4’’ toward the outer edge of the rootball. Check and make sure the tree is straight. Also make sure that you can see the flare of the trunk; it should not be covered. Planting new trees into the ground isn’t the end. Watering is very important. The amount of water varies on the type of tree and soil conditions at the planting site. If you are unsure, ask your local gardening expert. Trees should be watered when planted and also the following day. Then follow with every 3 days or so. The first 2 years of the tree’s life are the most important for establishing roots. When you water, try to do a slow drip so that it can soak down deep and encourage deep roots. Some sprinkling systems may provide adequate watering, but try to avoid high pressure sprinkler heads from spraying the trunk of your tree. It’s not necessary to fertilize trees during their first season. Don’t forget to monitor the health of your tree as time passes by. If you notice the leaves or needles look sick, take a sample of the problem or at least a photo to Western Gardens where their experts there can diagnose most problems just by examining your sample. They can give you suggestions for chemical and/or organic methods to resolve the issue. Planting new trees is a wonderful experience because you are investing in the future.